Capital Metro is testing the feasibility and safety of bus bike racks that hold 3 bikes each. Starting today, ten brand new 35’ buses will be traveling on Routes 338 (Westgate) and 325 (Rundberg) equipped with 3-bike racks. They are the first of 3 route-pairs that will test the 3-bike racks over the next 6 weeks, from September 10 through October 21. Capital Metro currently uses 2-bike racks on all its 35’ and 40’ buses and is evaluating the use of the 3-bike racks for future new buses, and perhaps retrofitting part of the system. Capital Metro Board Member and Austin City Councilman Chris Riley advocated for the pilot to explore options for accommodating more cyclists on board transit. We’ll keep you posted how the test goes. The 3-bike racks will be used on 2 routes for 2 weeks each to get an idea of their impact for bike transport on the buses. These routes are considered to have the most potential benefit from these racks, and focusing on only 2 routes at a time will allow most if not all buses on that route to be consistently equipped with the 3 bike racks. After the 6 weeks period, the 3-bike racks will stay in the system on less specified routes. We will be surveying the drivers and asking for comments from cyclist/users as well to gain input through this period. Check out the new racks and give us a holler at feedback@capmetro.org. Capital Metro has been pleased to see a fairly constant increase in train ridership over this past year. Growing ridership on the trains includes cyclists who transport their bikes on the train and then use them to connect to their origin and/or destination, sometimes resulting in crowding. Capital Metro wants to accommodate the needs of cyclists while providing optimum services to our other passengers as well, so we are taking steps to address cyclists’ needs in a variety of ways. 1) We are looking at first/last mile opportunities to help cyclists and other passengers to connect to/from the trains. A first mile/last mile survey will soon be posted on our website. The survey will be available through November 2011, and we welcome your participation! We will alert readers when the survey is available. Capital Metro recently installed new bike parking at Kramer Station. 2) We recently installed new bike racks at Kramer Station, south of the platform. This station has consistently had the highest volume of bikes since the train opened. Racks are added to stations/stops as part of an ongoing process. Capital Metro has been working with a number of public and private entities to develop the land surrounding the Leander Station, which will be the “end of the line” for the first phase of the MetroRail Red Line when it opens in March. But don’t think “sprawling suburban shopping center” development. Think “walkable community,” a “live, work, and play” development, a transit oriented development (TOD). TOD is a smart choice because it’s denser, more efficient, and gentler on the environment than traditional developments. It creates a sense of place, a community where people can reduce their dependency on cars. It promotes healthier neighborhoods, too, where people walk and bicycle and get to know their neighbors. In this kind of economy, it can also be a boon to communities, as national studies have concluded that for every $1 investment in a transit project, the community will yield about $6 in local economic activity. * In 2005, the Leander City Council approved the Leander SMART Code, which is the blueprint for TOD development for more than 2,000 acres in northeast Leander. 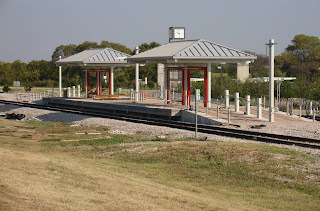 * Capital Metro’s Leander Park & Ride opened in 2007, giving commuters ample time to “get friendly” with the station site, and with public transportation in general. Ridership on the Express bus routes that serve Leander have experienced sustained growth. October 2008 photo of the Leander Station. 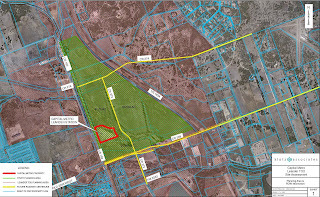 * Capital Metro has a working agreement with the development group that owns the 80 acres immediately adjacent to the Leander Station. Their land actually surrounds the station on three sides and is planned for a mixed-use TOD. Capital Metro and the developer are working on joint plans for eventual development of the Leander Park & Ride, in concert with the 80-acre TOD. A common land planner will ensure that both projects move forward with a unified approach. * Road infrastructure surrounding the Leander Station and TOD site are well underway. Delays due to the discovery of an historic ranch house slowed the process of approvals and funding for CR 274, but the concerns have been resolved, and design has begun. CR 273 is under design, and the Capital Area Metropolitan Planning Organization recently issued a $4 million grant for its construction. CR 269 to continue west from 183A to CR 2243 at its intersection with US 183 (at the H-E-B) is now under design. * A pedestrian/bicycle connection will be under construction soon, from the northwest corner of CR 2243 across US 183 by crosswalk to a sidewalk extending from the northeast corner of the intersection north to the southern end of the MetroRail boarding platform. The connection will be complete before the rail service begins.